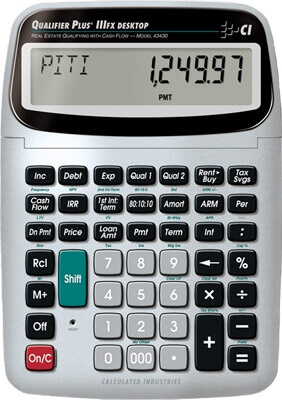 The Qualifier Plus IIIFX DT offers all the features of the hand-held calculator in a convenient desktop model. Large keys and an easy-to-read, adjustable display make it perfect for office use. Gain instant access to PITI and Interest-Only Payments or figure out the Blended Rate and Payment for Combo Loans. Solve your Commercial Investment deals with the Cash Flow, IRR, NPV and NFV functions.